The valley of the son of Hinnom was used as a symbol of God's judgment on the sins of the people. Ge-Hinnom was the name of the valley in Old Testament times, so how did its name mysteriously change to hell in the new? It is very interesting that, with only one exception, the only person to ever speak of Gehenna was Jesus Himself, and that not very often. Did the early apostles short change the Gentiles? So Why Was Jesus The Only One To Speak of Gehenna? The word Gehenna was the Greek transliteration of gê-ben-hinnom (the valley of the sons of Hinnom), an actual geographical site in Jerusalem named after a real person. It is a deep and narrow ravine on the South West side of Jerusalem - first mentioned in Joshua 15:8 and in 18:16 where it says that the boundary line between the tribes of Judah and Benjamin passed through the valley. However, this now pleasant looking valley was once the scene of acts of unspeakable barbarity overseen by two of the most monstrous kings of Israel... Ahaz and Manasseh. The fiendish custom of child sacrifice seems to have been kept up until king Josiah came to the throne and put an end to it and other every pagan practices the Israelites were indulging in. Although king Josiah effectively ended this extremely cruel practice, God never forgot what had taken place there. When the prophet Jeremiah warned the Jews of God's impending judgment on them at the hands of the Babylonians, he told them that the valley of Ben-hinnom would be called "The Valley of The Slaughter" because, in just retribution, the Jews would slaughtered and buried in the same place they killed their defenseless children. Jeremiah was actually instructed not to pray for the people because God would not listen (Jeremiah 11:14). However, the imagery was not used solely of the Jews. Isaiah said the Lord already had a funeral pyre prepared in the valley of Hinnom for the king of Assyria. In summary, the valley of the son of Hinnom was used as a symbol of God's judgment on the sins of the people. What is really perplexing is the fact that this very same place Gehenna (Ge-Hinnom) that English Bibles correctly render "the valley of Benhinnom" in the Old Testament, is always translated Hell in the New. This does not make a whit of sense since both sections of the Bible are talking about exactly the same place. Ge-Hinnom was the name of the valley in Old Testament times, so how did its name mysteriously change to hell in the new??? It is claimed that, in later years, the Valley of Benhinnom became the common dump site for all the refuse of Jerusalem. Rubbish, animal carcasses, and the dead bodies of criminals were all said to consumed by a fire constantly kept burning in the valley. Not only is there a complete lack of archaeological or literary evidence that supports this claim but it doesn't even make any sense. Consider - Jerusalem was not a very large city, at least not by modern standards. The book AD 33: The Year that Changed the World by Colin Duriez points out that, the number must have dramatically increased during the feasts, in all likelihood Jerusalem's population was usually between 60 and 120,000. Life was much simpler in the first century - people did not have as many possessions as we do and certainly did not produce anywhere near as much garbage - i.e. no paper, no plastics, no food cartons, disposable diapers etc. And how many animal carcasses could there have been? For that matter how many criminals could there have been? The myth of the ever burning fires in Gehenna continues to be perpetuated for one reason and one reason only - it supports the idea of the eternal fires of hell. And here is an additional problem - Because it was such a well known (read notorious) valley just outside the city- had you, back in the first century had you stopped and asked a passer-by directions to Gehenna, they would have pointed you in the right direction. So, let me ask you this - when Jesus used the word "Gehenna" without any explanation or elaboration, do you seriously think that a place of misery in another world that they had never even heard of would have popped into their heads. Or does it make sense that they would have immediately thought of the valley of Hinnom just outside their city? Jesus' Jewish audience, more than familiar with the words of the prophets, would immediately have understood that He was warning them of God's judgment. In other words, Jesus only mentioned Gehenna in three basic teachings - not near as often as it may seem from a casual reading. 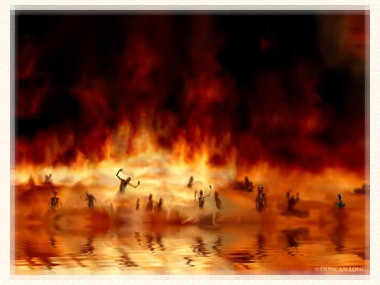 If the popular concept of never ending punishment in hell is the inescapable destination of everyone who ignores or forsakes the Gospel, then the salvation offered by Christ and the unimaginable horrors of Hell, should have been the two most repeated messages in the New Testament. People should have been warned in language so clear that no one could possibly misunderstand what was in store for them if they did not obey God's commandments. How then do we account for the fact that other than these few uses by the Saviour, the rest of the New Testament authors, with the sole exception of James, never even once mentioned Gehenna? That's right! They uttered not a single word about what is supposed to be the most terrible of punishments. The Book of Acts is an approximately 30 year history of the early church, from it's fledgling beginnings to its spread among the Gentiles. Yet, the early apostles who took the Gospel to men of all nations, never once saw fit to warn people of the torments of Gehenna. The fact is that they never even hinted of such a place. Paul who wrote 14 different epistles which make up about two thirds of the New Testament and said he did not shrink from declaring to them "the whole purpose of God" (Act 20:27) never once mentioned the horrors of Gehenna. He did however, speak of Hades in 1 Corinthians 15:55 - in the context of Jesus' triumph over it, which I will come to later. John, who wrote the gospel, three epistles, and the Book of Revelation, never once mentioned eternal torment in Gehenna. Peter never mentioned a place of eternal woe. Neither did Jude. The answer is extraordinarily simple. Jesus was virtually the only person in the New Testament to speak of Gehenna because He was the only one who's teachings were directed at a strictly Jewish audience. If Gehenna was a future place of punishment for all sinners, why was nothing said to the Gentiles? Did someone forget to tell them, or did the early apostles conspire amongst themselves to not warn the Gentiles about the terrible punishment that awaited all sinners? And since no completely sane Bible believer would entertain either of these two possibilities, the answer has to lie elsewhere - which it does. Jesus spoke about Gehenna to his audience simply because He was speaking of the valley of Ben-hinnom outside Jerusalem a place that most Gentiles would not have known the first thing about. Had the apostles later mentioned Gehenna to any of the Gentiles, their reaction would probably have been "huh!" - because they would have been largely ignorant about Gehenna's physical location, history, and role in prophecy. Only the Jews would have understood that GeHinnom was used by various prophets as a symbol of God's judgment on the sins of the people. Why Are We Ignoring So Many Greek Words that tell us that the punishment for sin is "death" - people are destroyed, perish, decay, rot etc.. Also bBased on the fact that the Bible says God created mankind in His own image, many Christians believe that the soul is immortal. Our Lord warned of the consequences of three remarkably similar actions. The Greek word translated fool is moros, which is probably the origin of our English word moron. The Greek word rhaka means worthless, senseless or stupid and may be related to the Hebrew rêyq (empty). There is not a whole lot of difference between the two, certainly not enough to justify such a supposedly huge difference in punishment. (The most the council could do would be to sentence someone to death, while hellfire is popularly supposed to go on forever). In any case, any sensible person should realize that all three consequences are hugely out of proportion to the offenses. Besides which, it is very unlikely the the Jewish council or Sanhedrin would bother with a case that involved no more that one person calling another a "fool". What we need to do, as always, is examine the context. And, when we do, we will find that, as He often did, Jesus was making a very strong point, not literally assigning particular punishment. In many ways, Matthew 5 was a face-off between Jesus and the Scribes and Pharisees, who were distinguished by a scrupulous outward obedience to God's law in order to merit blessing, all the while bragging that they were not sinners like other men. They took great pains to avoid offense in very small matters, scrupulously observing the smallest technical details of the law, while ignoring the bigger moral issues of hypocrisy, deceit, oppression, and lust. Woe to you, scribes and Pharisees, hypocrites, because you devour widows' houses, even while for a pretense you make long prayers; therefore you shall receive greater condemnation" (Matt. 23:14). Beginning in the second half of Matthew 5, Jesus zeroed in on the spirit of the Law. He quoted several of God's commandments (verses 21, 27, 33, 43) beginning each example with the words.. "You have heard that it was said, but I say to you …". He was showing how the scribes and Pharisees interpreted and outwardly obeyed each law, then revealed what God's true intent was in each case. In the first example, Jesus expanded the meaning of the sixth commandment "thou shall not kill" (Exodus 20:13; Deuteronomy 5:17), which is better translated you shall do no murder. Prior to this, unjustified negative feeling towards another human being was acceptable - as long as one did not actually commit murder. Jesus, well aware that like all sin murder usually begins in the human mind, was addressing the adverse emotion behind the deed and calling it wrong (Vs. 21-26), making the point that the perpetrator would be in danger of the judgment. Jesus then carried this concept over into adultery and lust. In other words, Jesus was certainly not telling people to gouge their eyes out, but was warning in very strong terms, that nothing on this earth is worth forgoing eternal life for. It is better to forfeit even those things we consider necessities, than to live in sin.